Arena 8 is the final arena before Legendary Arena so you need to be ready to make that final jump through this arena. This requires having some of the best decks in the game. Of course, since no new troops are unlocked in Arena 9, the two arenas will have similar best decks but usually in Arena 9, all decks have legendaries. Ill try to keep these decks as legendary free as possible. This is my personal deck at the moment and it works absolutely amazingly in Arena 8. Of course, there is the small struggle of getting both the princess and the miner, but if you do this is perfect to use. Usually, you want the miner in the front of your push, with a series of 2 troops behind, 1 support and 1 offensive. 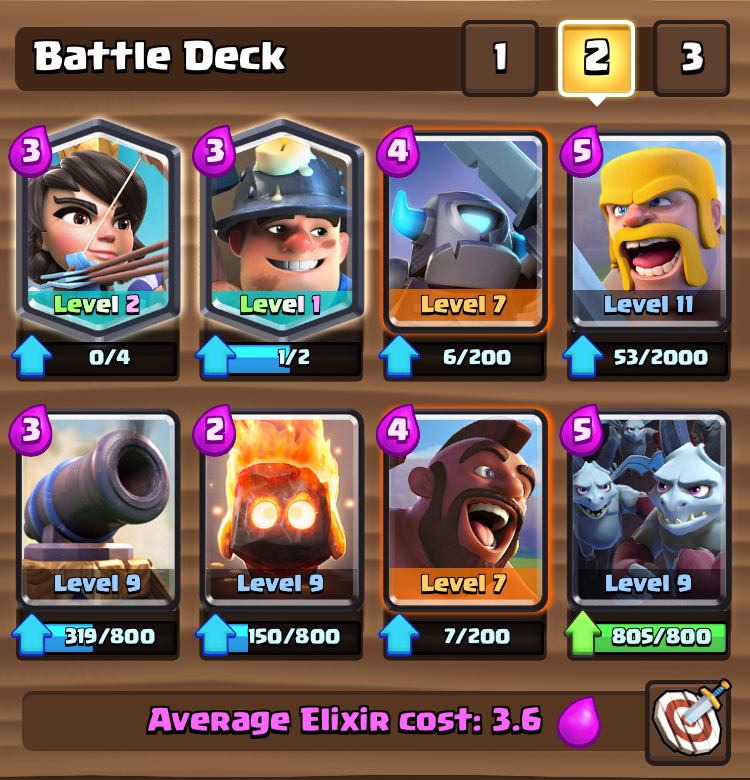 The 2 supports you can use are fire spirits and princess while the 2 offensive units are mini-P.E.K.K.A. and hog rider. A number of different pushes means lots of success. This is almost completely OP at the end of a battle, which makes it one of the top 3 best decks for Arena 8. Play defense the whole game, like all three musketeer decks and then the last minute turn up the heat! The ice spirit and fire spirits are more than enough to defense any spam units that aren’t princes, P.E.K.K.A., giants, or golem. If needed, play three musketeers, but mainly you want to keep that card hidden until the very end when you build your final push up. 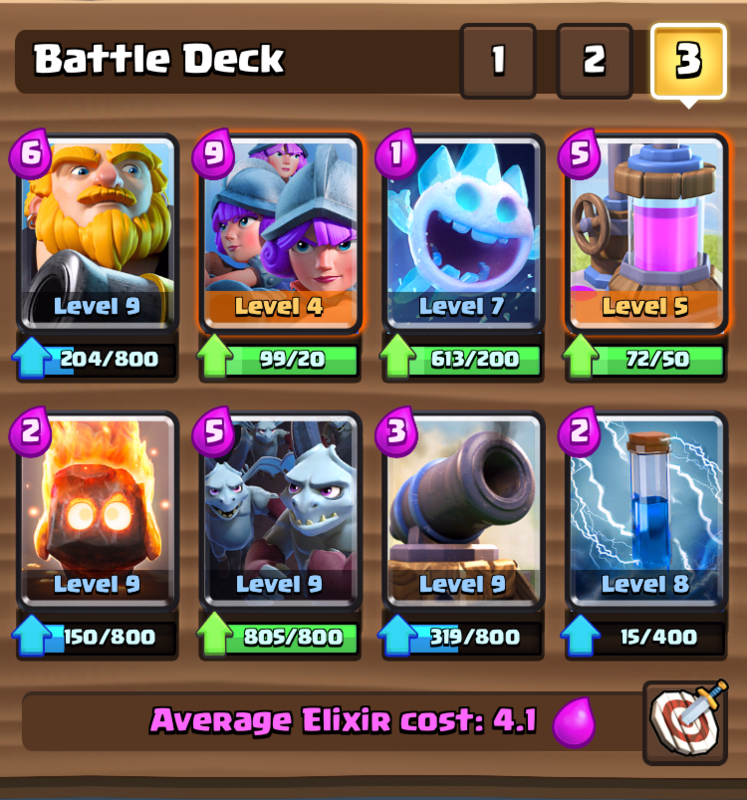 The hog trifecta deck is by far one of the most used decks in the game right now for both Arena 8 and Arena 9, but there is a solid reason for that. 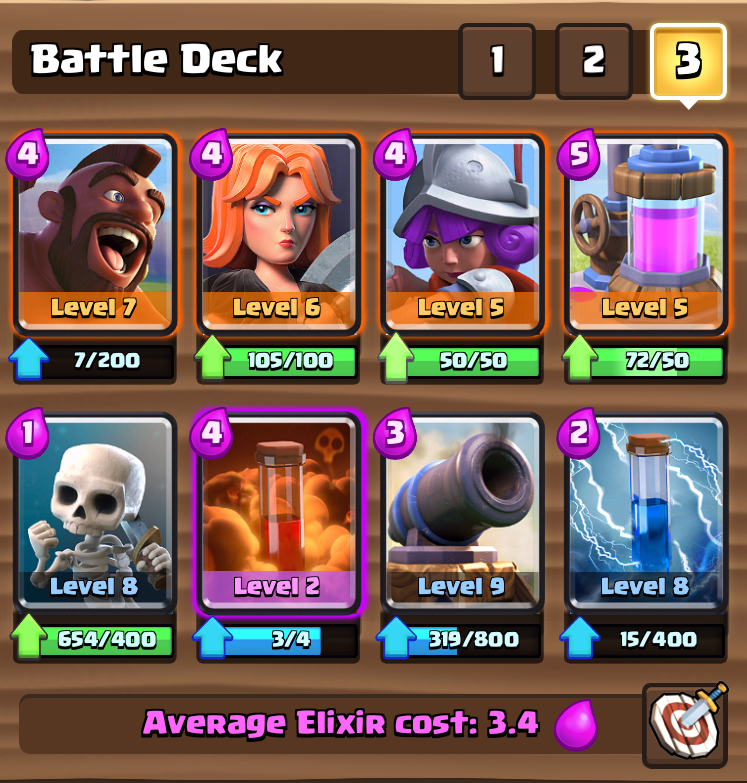 The hog trifecta deck is a very strong deck because it is so versatile. You can defend or you can attack using a number of different cards and spells. The elixir collector helps build up elixir for the more expensive 4 elixir cards while you can cycle through the other ones for offensive. The best push is hog, valkyrie, zap. Thanks for reading the three best Arena 8 decks in Clash Royale right now! Check back soon to see the best Legendary Arena decks in Clash Royale! Pingback: 3 Best Clash Royale Arena 8 Decks | Clash of Clans Guide, Strategies, Tricks and More!